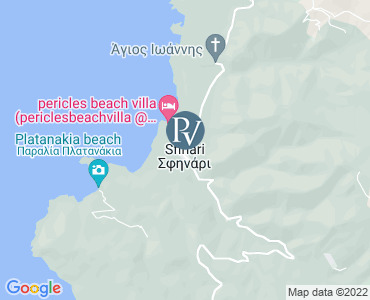 Villa Koralli is a delightful 3 bedroom Premier Villa located above the tiny village of Sfinari near Kissamos, some 57 km south-west from the centre of Chania on the island of Crete, Greece. Located in the western side of the Island, guests can enjoy magnificent views and sunsets over the gulf of Sfinari from the comfort of this wonderful villa. Villa Koralli is a spacious 3 bedroom, 3 bathroom well designed villa, with beautiful mountain and sea views. It is designed to a high standard with features such as a fully-fitted kitchen, generous dining space, and hyrdo-massage showers. There is a spacious living room connected with the dining area and the kitchen. On one side of this luxury villa are two double bedrooms. One of them has its private bathroom with jacuzzi facilities. On the upper floor a master bedroom with its own private deluxe bathroom with jacuzzi facilities. The outdoor area of the villa enjoys beautiful gardens where children can run across the lawns and there is plenty of seating to accommodate the whole family. You can spend evenings sipping local wine and eating freshly made food from the BBQ or head out to one of the family-friendly restaurants in the area. Please note there is a discounted rate for couples staying during the months of April, May and October. The village Sfinari, is a small and traditional village with views over the gulf of Sfinari. The exceptional sunset, placed in the Western side of the island, is one of the most magical sunsets that you could enjoy. The Sfinari's settlement has a mere 150 permanent residents and embraces the homonymous cove. The village is built on the feet of Koytroyli's mountain and is extends down to the beach.The local population work with olive growing, livestock-farming, fishing, and apiculture during the summer months. All of the traditional food and drink of the area are created with only the best of local products. The area is ideal for a quiet and peaceful holiday as the area is so untouched - far away from the hustle and bustle of the busier towns on the Island. The closest beach to the villa is exactly 400 metres by a sealed road (2 mins drive or 5 walking). Here there are also 3 tavernas: Sunset and Capten Fidias are the best organized. The beaches of Elafonisi, Falasarna and Balos are also nearby and make the area one of the most popular in Crete. When you want to head further afield, Chania has many family friendly places to visit, including a Cretan Craft Museum and Chania Harbour where you can eat, drink, browse local gift shops, and take in wonderful views. All prices are per week for the villa only. Villas are booked from 2:00pm on your arrival day (Saturday) to 10:00am on your departure day (the following Saturday). Please note that availability shown is subject to confirmation - please call our reservations team 01243 514970.